Make sure your resume graduates with honors. Does your resume make the grade, or is it barely getting by? To land your first job after graduation, resume expert Kim Isaacs says it helps to have a comprehensive resume that will put you at the head of your class. 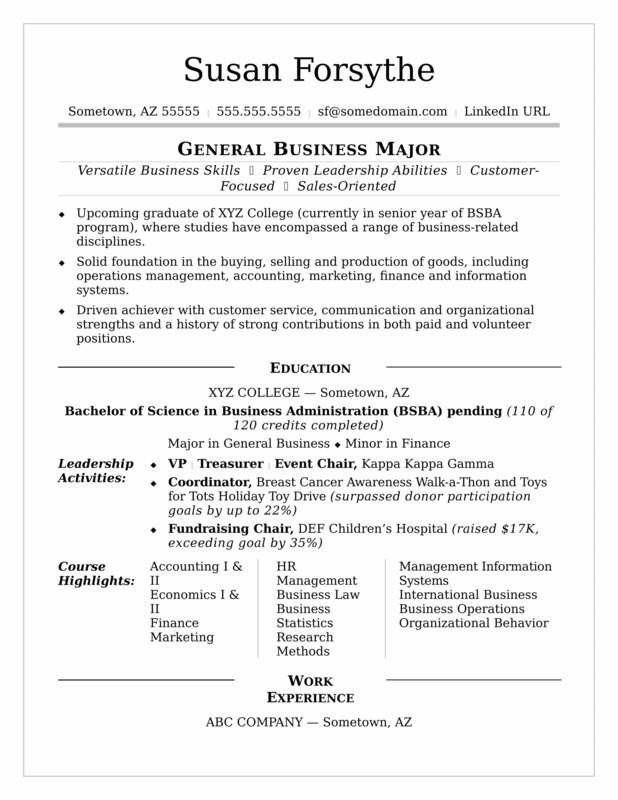 View the sample resume for a college student that Isaacs created below, or download the college student resume template in Word. According to a 2018 Monster survey of college graduates, 74% said they believe resumes are important to employers, yet only 23.9% have had a professional look over their resume. This template is a great starting point, but you’ll definitely want to get a second pair of eyes on it from Monster’s Resume Writing Service to help move your resume to the top of the pile. Additionally, you can learn about entry-level careers or search for college student jobs on Monster. Upcoming graduate of XYZ College (currently in senior year of BSBA program), where studies have encompassed a range of business-related disciplines. Solid foundation in the buying, selling and production of goods, including operations management, accounting, marketing, finance and information systems. Driven achiever with customer service, communication and organizational strengths and a history of strong contributions in both paid and volunteer positions. Work in family-owned commercial and residential landscaping company. Perform business and administrative tasks, respond to customer inquiries, schedule jobs and assist with sales calls. Demonstrated business, sales and financial acumen in efficiently handling multifaceted assignments. Ensured timely, accurate preparation of invoices, payroll and accounts payable records. Helped close sales, including a $12K contract win with a large resort hotel. Delivered friendly, courteous customer service in all phone and face-to-face client interactions. Your diploma is now the second most important piece of paper with your name on it. Taking the top spot? Your resume. Want to make sure it's ready for a job search? Get a free resume evaluation today from the experts at Monster's Resume Writing Service. You'll get detailed feedback in two business days, including a review of your resume's appearance and content, and a prediction of a recruiter's first impression. Think of it as part of your continuing education.